I was going to use either a photo of the moon or a photo of a flower that I took, but this little baby stole my heart. It seems it fell off the roof or tried to fly and failed. 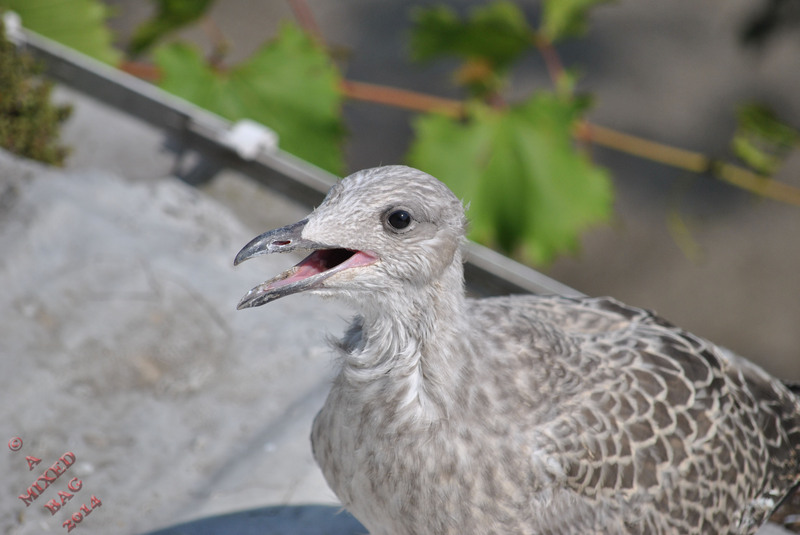 It had been on my balcony for a couple of days and was being attacked by other seagulls. It was on the other side of the fence and when I went near it, it would run away. Then yesterday, it squeezed through the fence onto the balcony. So I picked up a towel and nabbed it. The vets around the corner deal with a seagull sanctuary, so I took it there. It was a hot day so I had my shirt undone, and my daughter told me to do it up as the seagull kept trying to peck at my piercing. That would have been excruciating I think. Maybe more so than when I had it done. So here is the little sweet thing. This entry was posted in Photography and tagged Animals, August, Birds, Creatures, Life, Nature, Nikon, Nikon D3000, Photo of the Week, Photos. Bookmark the permalink. Glad you have a vet nearby to help this little guy. Great catch, Al! It seems that the bird communicate with you! He looks like he wants to say something. I’m glad you were able to rescue him and nice shot, too! Haha. It involved yelling things that ended in “off” Glad I was able to nab it though. How lovely you could rescue it! Surely he was happy! I like a photo with a story behind it. Perhaps next time you can use a bit of artistic license, I find burning buildings, a hail of bullets and a mysterious blonde always get the reader stats up some more. Great pic and great words describing it! Excellent picture. Have you had any luck accessing other blogs yet?